We are pleased to announce that Dr. Damilola Olawuyi is joining the Sabin Center as a David Sive Visiting Scholar. Dr. Olawuyi currently serves as the Director of the Institute for Oil, Gas, Energy, Environment and Sustainable Development at Afe Babalola University, Ado Ekiti, Nigeria. He also provides legal advice and services as an energy lawyer with the leading global law firm Norton Rose Fulbright LLP, Canada. A prolific and highly regarded scholar, Dr. Olawuyi has published extensively on climate justice, sustainable resource governance, and the intersections of human rights and the environment. His most recent work is the forthcoming publication, The Human Rights Based Approach to Carbon Finance (Cambridge University Press, March 2016). While at the Sabin Center, Dr. Olawuyi will work on developing the guiding principles of a corporate risk management framework through which business enterprises can identify, assess and mitigate human rights risks in climate investments and projects. 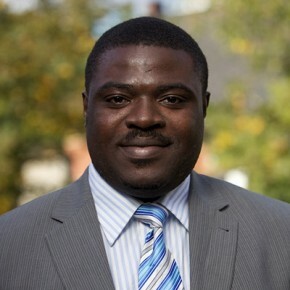 Coming at a time of real need, when the 2015 Paris Climate Agreement has recognized that parties must respect, promote, and consider human rights when taking action to address climate change, Dr. Olawuyi’s research will examine practical steps through which corporations can move from “corporate consciences” on climate change to “corporate compliance” in their approach to climate investments and projects. This research will complement the Center’s other work in this field, such as our report on Climate Change and Human Rights that was published by the United Nations Environmental Programme (UNEP) in December. Dr. Olawuyi will be the Sabin Center’s third David Sive visiting scholar. Our previous scholars included Professor David Markell of Florida State University School of Law and Professor Daniel Selmi of Loyola Law School in Los Angeles. As a reminder: The Visiting Scholar position accepts applications on a rolling basis from legal scholars, practitioners and government officials in environmental, energy and natural resources law who are interested in joining us for a sabbatical semester, summer or other short-term visit. Further details are available here.